In the scenic backwaters of Alleppey in Kerala lies the famous Vembanad Lake. It is a serene and peaceful lake which stretches all the way up to Kochi. On the second Saturday of every year there is a major event which takes place in these calm waters and it is called the Nehru Trophy Boat Race. Vallam Kali is what the locals call it, which translates to Boat Game. The most popular event during these races is the competition of Chundan Vallams or Snake Boats. Apart from the snake boats there are other categories of boats which participate in various events of the race. The town of Alleppey is filled with locals and tourists alike during this event which will take place on the 8th of August this year. Hordes of people swarm the banks of the lake and one can also rent a shikara or a house boat to view the race from a closer distance. 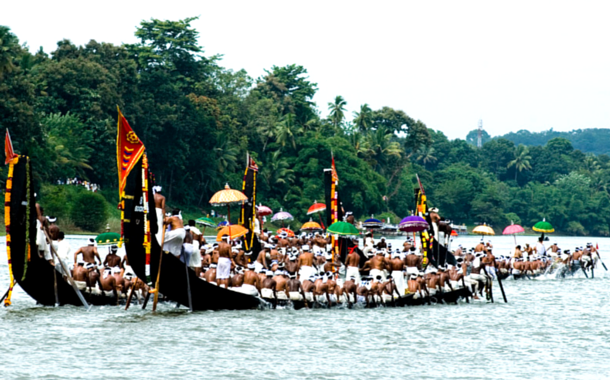 This synchronized rowing of the long snake boats is a rare spectacle and it is further glorified with ceremonial water processions, floats and decorated boats. Getting there is quite easy, the closest railway station is Alappuzha which is about 8 kilometers and then you can take a canoe, a house boat, shikara or use the local ferry service to reach the lake and view the race in its full glory. This is a festive time in Alleppey so expect the guest houses and hotels to charge a tad bit more than the usual. Pre-planning is important as the various tourist guest houses and hotels do reach their full occupancy. The first Prime Minister of Independent India visited Kerala in 1952. Pandit Jawaharlal Nehru was given a resounding welcome by the people of Aleppey, escorted by the long snake boats. Feeling excited and humbled by the hospitality of the locals, Pandit Nehru donated a rolling trophy which will be awarded to the winner of the race. This trophy is a replica of a snake boat in silver, placed on a wooden abacus. These snake boats are 100 to 120 feet long canoes constructed from a wood which is locally known as “Aanjili Thadi”, it has a carrying capacity of 90 to 100 rowers and its snake like movement through the channels have earned them this name. 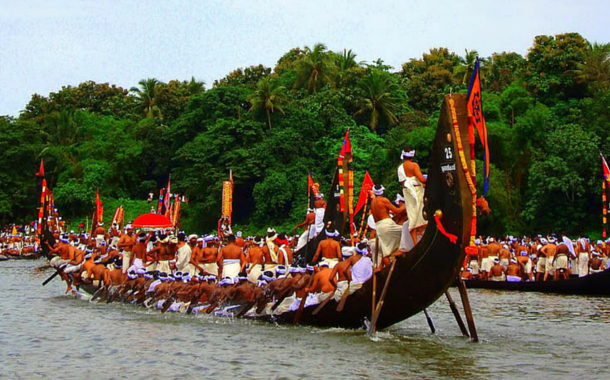 The Chundan Vallam or the snake boat also holds the record as “the biggest water vessel used for sport purpose”. There are clubs and teams from all over the state which participate in this race and on an average the rowers produce 90 to 120 strokes per minute and can cover a distance on 1.4 kilometers in 5 minutes. Apart from the oarsmen the boat also has a group of 25 singers in a row at the middle between the oarsmen. These singers sing the vanchipattu (boatman’s song) which helps the oarsmen row in a rhythm. At the middle of the second half of the boat is a platform for eight people to stand, from where the cantor leads the song. Apart from the boat race, renting a houseboat is yet another unique experience for every tourist who visits Alleppey. An entire family or a group of friends can rent one out for 24 hours, this houseboat runs through the many backwater channels and offers breakfast, lunch, dinner and snacks to its passengers. Alleppey was once known as Venice of the East. It is scenic, serene and has an air of peacefulness. However expect it to be up in a roar during the festive season. There are many other tourist attractions in Alleppey so do make sure to visit them during your stay. So the next time you plan your Kerala holiday, book your Kerala tour package in such a way that you get to witness The Nehru Trophy Boat Race.